Boasting a spa and pool, Parkroyal on Kitchener Road is in the heart of Little India, next to City Square Mall. Steam bath facilities and massage services await guests. Kitchener Road’s Parkroyal is a 5-minute walk from Farrer Park MRT Station and the 24-hour Mustafa Shopping Center. Singapore’s shopping belt, Orchard Road, is a 15-minute train ride away. 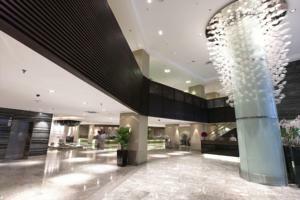 Modern rooms at Parkroyal offer guests the convenience of free Wi-Fi. Cable TV channels are included. Tea/coffee makers and minibars are provided. Guests can work out at the well-equipped gym, which overlooks the pool. A business center and tour desk is available in the hotel. Asian and International favorites are served at Spice Brasserie while Chances Lounge offers guests a place to unwind over cocktails. Free! All children under 12 years stay free of charge when using existing beds. Free! One child under 2 years stays free of charge in a baby beds. One older child or adult is charged SGD 70 per person per night in an extra bed. The maximum number of extra beds/baby beds in a room is 1. Any type of extra bed or crib is upon request and needs to be confirmed by management. Supplements are not calculated automatically in the total costs and will have to be paid for separately when checking out.